The Rinkhals are a species of venomous snakes belonging to the family of Elapidae. These snakes can mostly be seen in Southern Africa. 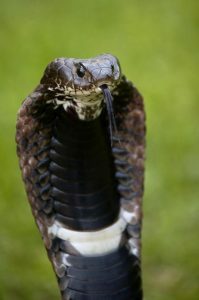 These snakes are not considered as true cobras as the species is monotypic. They do not belong to the genus Naja, even though they are closely related to them. Rinkhals are among the true spitting cobras. They are also known as Ringhals or Ring-necked Spitting Cobra. They are the only species of the genus Hemachatus. A small population of these snakes has been spotted on the borders between Zimbabwe and Mozambique around Inyanga. The body may vary in color and can be black, brown or browny-black. These snakes have dark colored spots on their body with two or three white, cream or yellow colored bands around the neck. The light colored bands generally fade to black in adults. The average length of a snake varies between 90 centimeters and 1.5 meters. The head is pointed and short and has sharp black eyes. 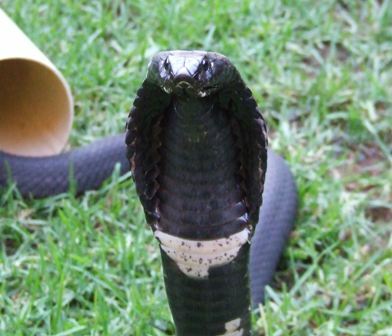 Some snakes have stripes on their body while others may essentially be black. Scalation is present in their body. The scales are different from the ones found in true cobras as they are keel-like and ridged. These snakes are found in a wide range of habitats. They primarily prefer to stay in grasslands as blending with the surroundings here is easier for them. They are also known to adapt well in diverse conditions that can be found in places such as mountains and locations of high altitude and at the sea level. They are also to be found in swamps and wetlands of South Africa. Rinkhals have adapted themselves quite well to urban development. These snakes are ovoviviparous, which is a unique trait among African elapids. They do not lay eggs; instead they give birth to their young ones. Typically, the breeding season in Rinkhals lifecycle starts from January and last through the late summer months. During mating, the male snakes tend to behave in a rather aggressive manner. They can even bite the female of the species while they are in an embrace during copulation. This can prove to be fatal for the female. The females may need more food to eat when they are impregnated. A mother snake gives birth to around 20 to 30 babies at one time, though the numbers might differ in certain cases. These babies are very small, almost around 15 to 18 centimeters. The young snakes shed their skin as soon as they are born. These young snakes are similar in their overall color and appearance to the adults. They also have the ability to raise their bodies and spit venom just like the adult snakes. These snakes are usually found easier to be raised as pets than some other species. This is a species of strong and sturdy snakes. They are intelligent and spirited, which make them a wonderful spectacle in zoos. They also make good pets. Rinkhals are a nocturnal species that is active at night but they are also found to bask in the daytime sun. When their body temperatures reach a maximum level, they move to an area of low temperature and cool off. They are extremely adept at maintaining their body temperature even in adverse weather conditions. If threatened, the snake will rear up and spread its hood and make loud hissing noises. They are spitting snakes. They can spit their venom at a distance of 2.5 meters. These snakes raise their bodies up, lean backwards and lunge at their opponent while ejecting poison. 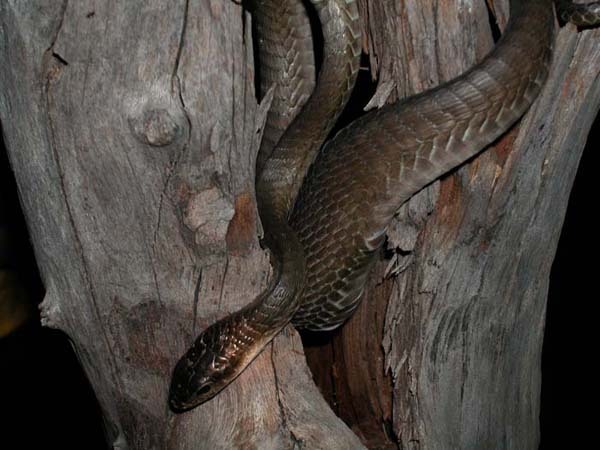 Deaths from bites of these snakes are rare but if the health problems caused by poisoning are not treated in time they can prove to be fatal. Given below is a picture showing an adult of the species. One of the most interesting fact about this snake is its tendency to feign its death. 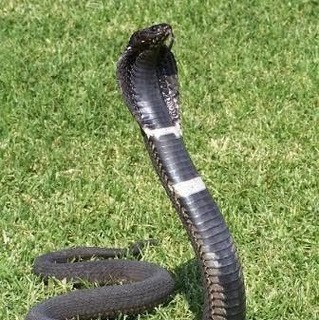 During a fight, if the opponent proves too strong for its initial attacking strategy of hissing and spitting poison, this snake acts limp and rolls over its back. It opens its mouth and passively hangs its tongue outside thereby convincing the adversary of its death. Once the opponent calms down and walks away, the snake comes out of its act and moves away on its own. If disturbed, they usually make a quick disappearance. They prefer to use distraction to bluff their opponents and find their way out rather than go for a direct confrontation. We live on a farm in the Eastern Free State and often have Rinkhals snakes come into the house. I have read that these snakes are nocternal,can you tell me what the fecies of the rinkhals looks like because we often find something in the mornings that appears to be either fecies or something that has been regurgitated and resembles a brownish/black cocoon.If that comes from a rinkhals then we have them living virtually on our door step.